This paper exists only on the 1598 spinett virginal which is by either Hans Ruckers (who died in that year) or, just at the start of his career, by Ioannes Ruckers. 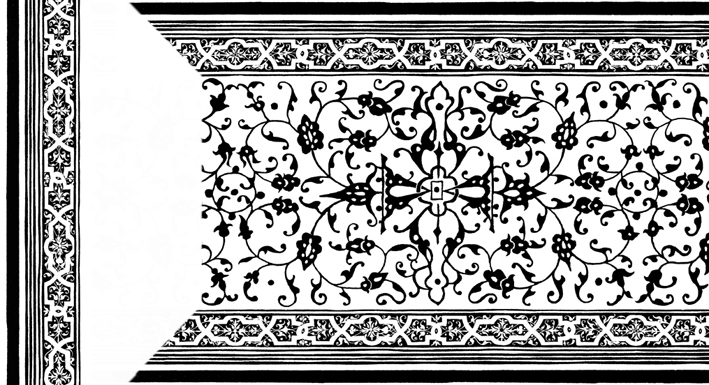 No other instrument has this paper pattern. The instrument on which this pattern occurs is in the Musée de la Musique, Cité de la Musique, in Paris. This pattern is the one used on the front flap of the serenely beautiful painting by Jan Vermeer called 'The Music Lesson'. This was painted by Jan Vermeer in Delft in about 1662 and is now part of the Royal Collection at Buckingham Palace. The detail above of the painting shows the paper very clearly. This paper also makes an appearance in a painting of 1669 by Elgon van der Neer called 'A lady with a cittern at the virginal' in the Collection Boijmans van Beunigen Museum in Rotterdam. Click here to see a larger version of this painting. The only record I have of this paper is a very old and rather over-exposed negative of the photograph that I took of this paper in the 1970's. This photograph has a scale as part of the image, so that the paper could be accurately reproduced to its original size. There are numerous defects in the original paper including a crack in the front flap which has been re-glued together with a resulting lack in the detail across the central part of the paper. There is also a non-original lock covering over a part of the paper. This photograph, with all of its defects, was used to produce a digital image of the original paper. This paper, and O'Brien Number 7, are the only ones produced digitally. All of the other papers are reproduced from wood blocks which I have cut by hand. Unlike all of the other papers listed on this site, it will be noted that this pattern includes its own integral border and does not require a separate border pattern glued around it. This border is found only along the bottom and top edges of the pattern as supplied and needs to be added along the right- and left-hand edges when glueing it in place. This requires a certain amount of care and planning ahead. It is intended that the pattern as a whole should be centred on the surface that you are covering, usually with the join between two of the patterns at the centre of the area covered. This means that the ends of the pattern do not coincide with the ends of the paper pattern. Therefore the ends of the pattern will not coincide with the ends of the area being covered by the paper pattern. One or two 'extra' strips of the border pattern are supplied with each order of this paper and these are intended to be used to fill in the border at the left- and right-hand ends of the area being covered by this particular pattern. In order to make the 'extra' border 'flow' around the central pattern in the usual way, it needs to be mitred into the main central pattern. One relatively easy way to do this is to cut the mitres in the border of the main pattern at a point that will give the total required length - including the width of the border pattern - for the space you are using it to fill. The figure below shows how this could be done at the left-hand end of the pattern. Here only the borders have been mitred at 45° at the top and bottom. Then, before the pattern is glued in place, the border pattern is slid to the right under the mitred corners of the main pattern until it abuts the central part of the main pattern. Sliding the border pattern up and down will reveal that, in a certain position, the border pattern will 'flow' around the mitre in such a way that the pattern is more-or-less continuous across the mitre. The degree to which the border pattern matches the existing border pattern on the main pattern depends, of course, on where the main pattern is cut according to the length of the area being covered. Once the best position is found, the border can be mitred in to the main pattern and the two can then be glued in place. Because of the length of the supplied border pattern, one strip of border is sufficient for providing the mitred borders at both the left- and right-hand edges of the area being covered. Hints on decorating the papers after they are laid.